New technology is a key element in tackling challenges faced in urban water management, such as poor water quality and increased water scarcity. New approaches are more likely to turn into real innovations (actually implemented and taken up by the market) if there is evidence of their benefits or added value in economic, environmental and social terms. This brief provides a series of five recommendations on governance design factors conducive to innovation uptake. 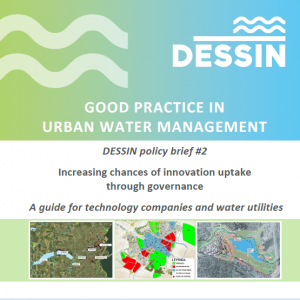 It is targeted to water managers and policy makers, aiming to create enabling environments for innovation uptake.